Berea, Ohio (April 20, 2017) NOSHOK is pleased to announce our re-engineered and expanded bimetal thermometer offering with cost reductions of up to 28% and significantly improved delivery times of 5-7 days. We are also announcing a new battery operated digital temperature indicator, and flanged thermowells. NOSHOK's new bimetal thermometers feature an improved design including a highly sensitve bimetallic helix coil which is silicone coated to maximize heat transfer and response time, as well as a 360° groove around the stem for easy immersion point reference. We have expanded our bimetal thermometer line to include industrial type, testing and general purpose, industrial type with external reset, and testing and general purpose with external reset models. These new NOSHOK bimetal thermometers feature a 304 stainless steel case, bezel and wetted parts, with an accuracy of ±1% full scale, Grade A, ASME B40.3. A wider variety of ranges, connections, lenses and stem lengths are also available. In addition more options are now available, including an adjustable union connection, certified calibration, glow dial, maximum or minimum indicating pointer, maximum and minimum indicating pointers, mounting flanges, silicone fill, special dials and stem types. 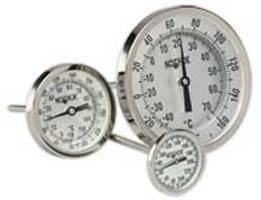 An eight year warranty is offered on the new 3" and 5" NOSHOK 300 Series bimetal thermometers. NOSHOK also announces the availability of a new battery powered digital temperature indicator. These indicators are an ideal replacement for bimetal, liquid bulb and glass thermometers in applications including pharmaceutical, food preparation, utilities and municipal, refineries, chemical and petrochemical plants, paper mills and hydraulics. They provide a five year minimum battery life, and feature a large 4-digit LCD display. In addition, we have expanded our thermowell offering to include raised face flanged thermowell process connections.